David and Vera Mace have spent almost forty years making a vital relationship of their own marriage, and, because of their inherent sense of purpose, consequently have enriched the lives and marriages of innumerable persons in some sixty countries around the world. David Mace's first degree was in science from the University of London. Earlier family influence led him on to Cambridge University, a degree in theology, and work in a mission church in the slums of London. Vera, already in youth work, joined him after their marriage in the work of the mission church. From that point on theirs was a partnership which focused on counselling persons in trouble. Later, a PhD. in sociology for David and a Masters degree with a thesis on Christian marriage for Vera, moved them into full time marriage guidance work. (Two children, a war causing forced separation for a time, and a pacifist stand by David which also made life more difficult, only strengthened them in their life's purpose.) Before leaving Britain permanently in 1949, they had set up more than one hundred marriage guidance centers and achieved their goal of recognition for the Marriage Guidance Council. It would be impossible to enumerate specifically here all the activities of teaching, published writing, training seminars and travels the Maces have shared. Theirs has been a life of richly varied experiences and shared responsibilities. From 1960-67 the Maces served as joint Executive Directors of the American Association of Marriage Counsellors. At present they are members of Summit Friends Meeting in New Jersey, currently living in Winston-Salem, North Carolina, where David Mace is Professor of Family Sociology at the Behavioral Sciences Center, Bowman Gray School of Medicine. David Mace delivered the 1968 Rufus Jones Lecture, Marriage As Vocation. This pamphlet and the project it presents is an outgrowth of that experience. 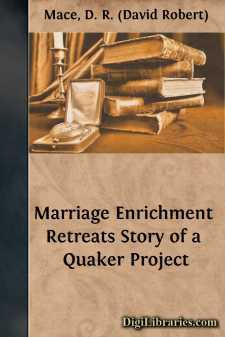 "How important is it that Quakers should have good marriages, and what should Friends General Conference be doing about it?" This question was asked at a gathering of ten married couples, all of them Friends, representing both the U.S. and Canada. What brought these couples together was the common bond that all had been leading marriage enrichment retreats at which six to eight couples, all with stable marriages, spent an intensive weekend sharing marital growth around the theme "communications-in-depth about relationship-in-depth."